Available now at RC Willey, this mini blue exercise bike from Stamina Products Inc.
will set you right back on your fitness track. This compact home gym equipment is the perfect addition to your healthy lifestyle. Easy storage and easy use set this affordable exercise equipment apart! When you're beginning your fitness journey, there's no better way to start than in the comfort of your home or at work in your cubicle. With the upgraded blue Stamina Mini Exercise Bike, you can do just that. In fact, you can use the mini bike to work your lower or upper body. To concentrate on your lower body, simply set the mini bike on the ground in front of the couch or under a table or desk and begin pedaling. For an upper-body workout, set the mini bike on a table, grip the pedals with your hands and begin rotating. The Smooth Pedal System utilizes gears instead of cranks, making your workout on the Stamina Mini Exercise Bike smoother than ever before. Even when you increase the resistance with the easy-to-reach dial, your strokes will remain smooth. This Smooth Pedal System also reduces skidding when the resistance is high as well. When you invest in this mini bike, you are investing in a piece of equipment you can take anywhere. This alone will make you want to continue improving your health, but there's another element that will help you during your workout: the multi-function fitness monitor. The monitor tracks your workout time, total stroke count, and calories burned to push you to keep pedaling. Even more, because of the tilting mechanism, this monitor adjusts to your position - whether you are using your arms or legs. 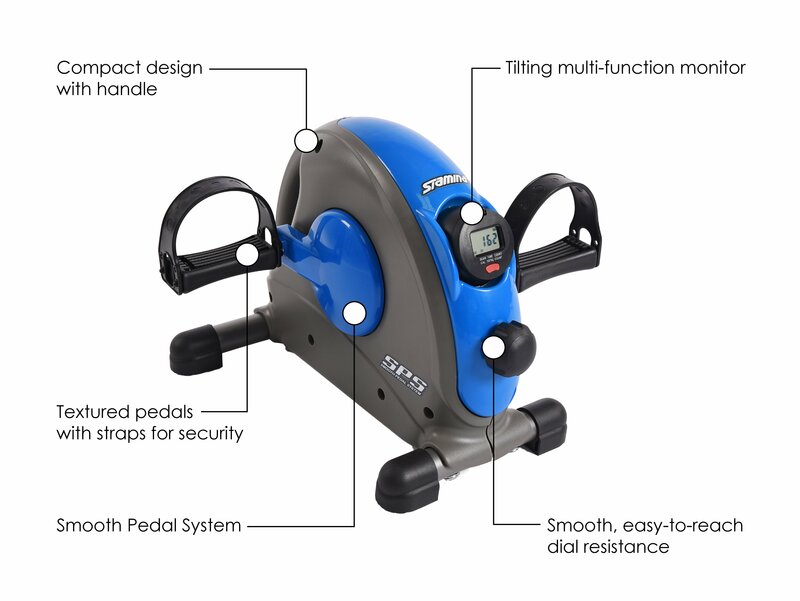 Stamina Mini Exercise Bike Blue is rated 4.0 out of 5 by 1. Rated 4 out of 5 by Love2excercise Easy to use This is good for seniors, especially. It moves as I’m using it but it’s easy to use and good excercise if you sit a lot. We seniors have a hard time riding bicycles due to falling, so this is a good alternative and doesn’t take up a lot of room.